Rich & tender, melt-in-your-mouth beef cooked low and slow in a hearty red wine sauce makes this Slow Cooker Beef Ragu a must for Sunday Supper! 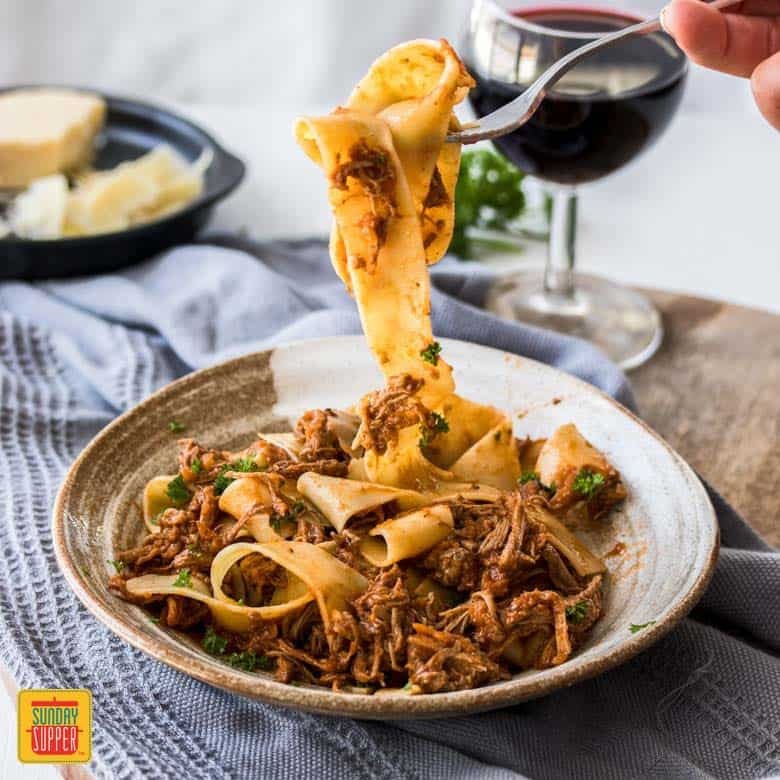 Slow Cooker Beef Ragu is a full flavored, slow cooked ragu perfect for a cold winter’s night. Served over thick strands of pappardelle, this is comfort food heaven. I just adore my slow cooker. When the cooler weather hits, I’m there every weekend throwing my ingredients into a slow cooker. I return home after running errands to the glorious aroma wafting around my house and an awaiting comforting meal. One of my favorites that I make over and over and over is this Slow Cooker Beef Ragu. Beef ragu is a thick, tomato based saucy Italian beef dish normally served with pasta. A ragu can be made with ground meat or cuts of meat like brisket which is slow cooked to tenderize the meat. The result is a richly flavored comforting meal made with simple ingredients in your slow cooker. While Bolognese is a type of ragu, it generally does not include tomatoes. Bolognese is often much thicker in consistency and has less sauce than a ragu. 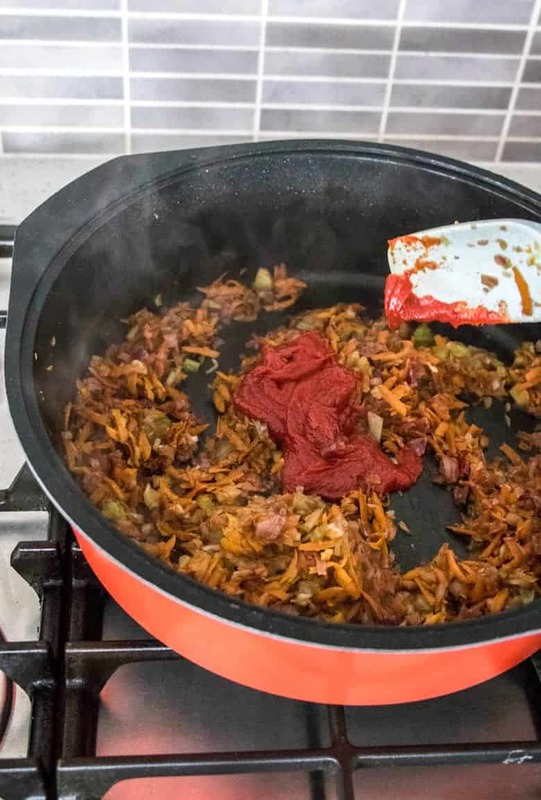 You may find it referred to as Ragu Bolognese to denote the difference between being a ragu and bolognese just like in these bolognese recipes – Homemade Bolognese Sauce and Authentic Ragu Bolognese with Tagliatelle. Let’s get down to business. 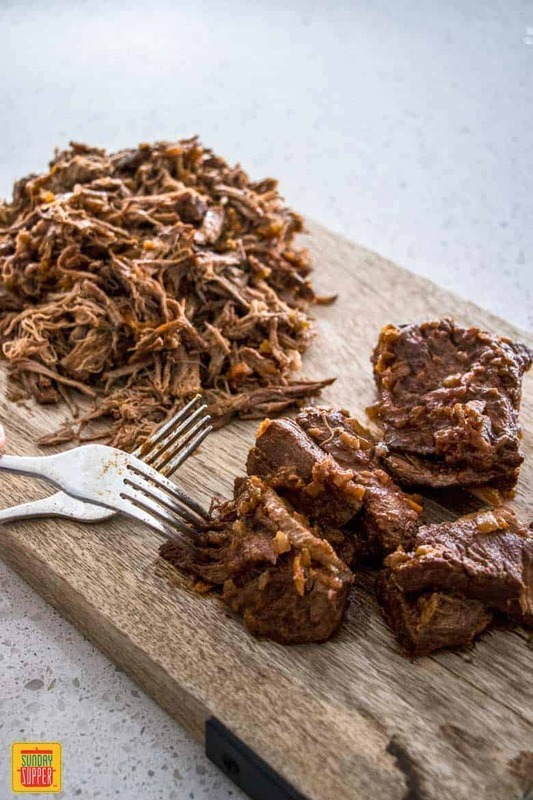 This Slow Cooker Beef Ragu starts with a 3 pound piece of brisket that you’ll cut into quarters. Make sure to remove most of the fat. Season the meat then brown it off in a frying pan. Place this straight into your slow cooker on low. Now we start on the sauce. Start by sautéing the onion, celery and carrots until a little softened before adding a good red wine. Please use the same quality you would drink – if it tastes bad to drink, it will taste bad in your ragu. Let that sizzle until almost disappeared. Next we add the tomato paste, tomato puree and beef stock – now that flavor is really getting good. Add the remaining ingredients and mix them all together well. 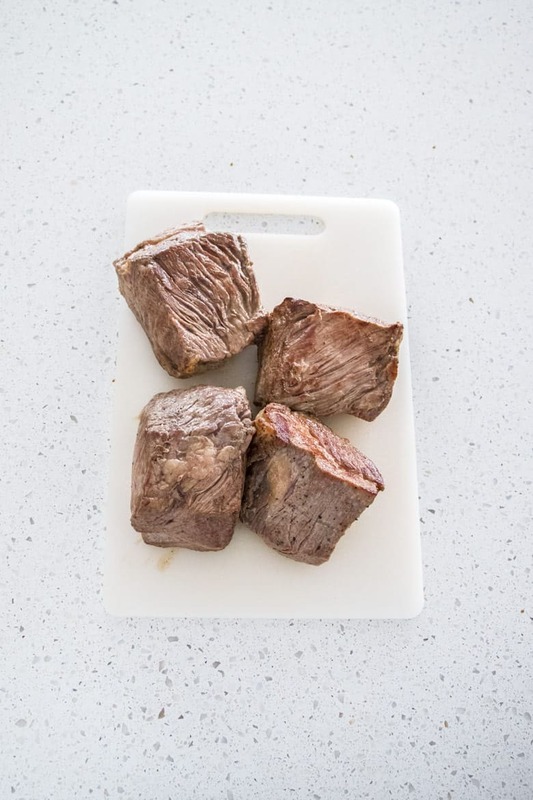 Pour this over the beef in the slow cooker and cook on low for 6-8 hours, stirring from time to time. 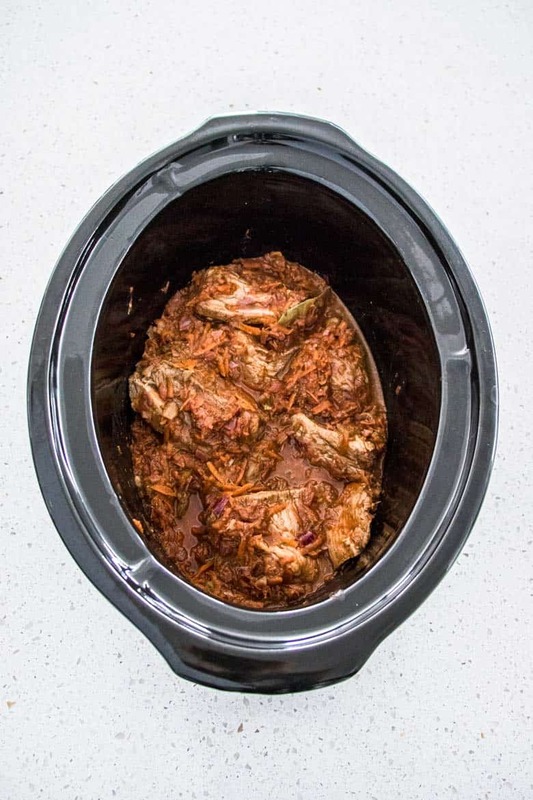 You just want to cook this slow cooker recipe it until the meat starts falling apart. Once it’s cooked, you can use two forks to ‘pull’ the beef into strands then mix it back into the sauce and serve with cooked pasta. 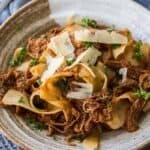 I just can’t go past nice thick pappardelle pasta for this slow cooker beef ragu but my hubby would eat it with rice (so not authentic 🙂 ). 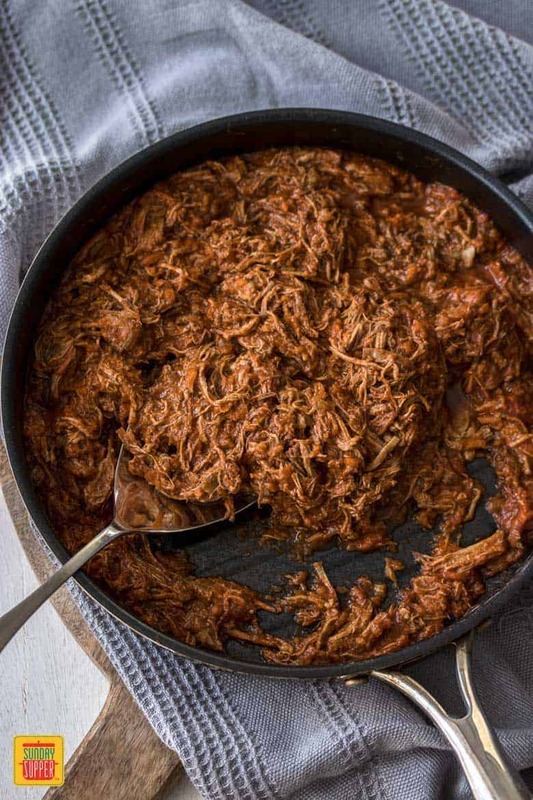 You could also serve this Slow Cooker Beef Ragu up sloppy joe style in a nice soft bun with cheese (if you try this, it’s best to drain away just a little of the sauce or the sandwich will just become a soggy joe). Or give these Bolognese Pull Apart Sliders a try – they are perfect for game day and using up leftover beef ragu! 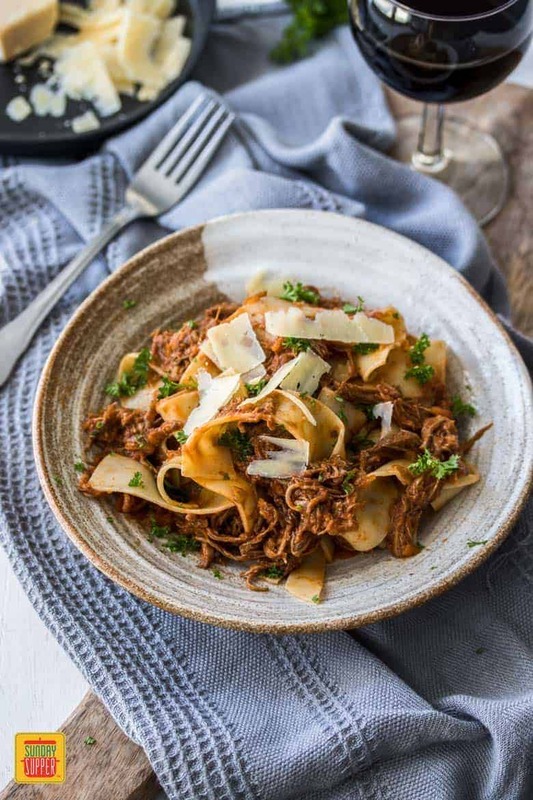 So if you’re after a comfort food classic, full of flavor and a meal that looks after itself while you do other things then this Slow Cooker Beef Ragu is definitely for you. Lovingly waiting for you to get home and devour. Want some more slow cooker meal ideas? 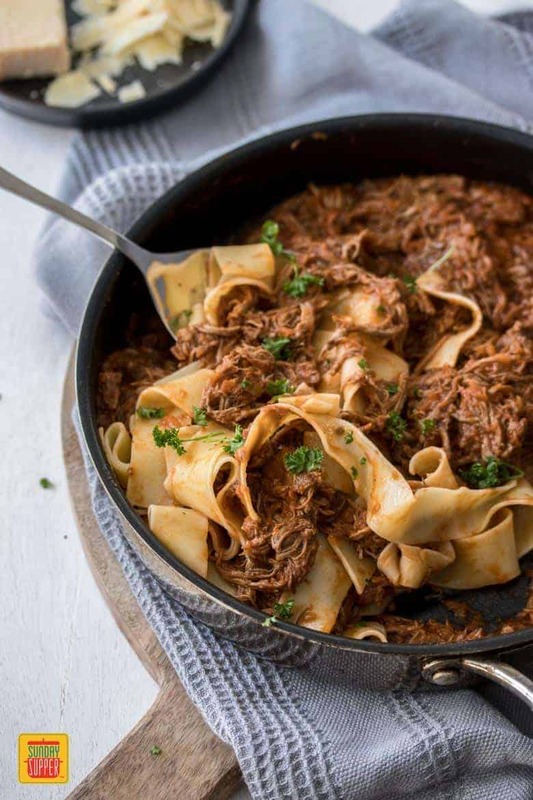 Slow Cooker Beef Ragu is a full flavored, slow cooked ragu perfect for a cold winters night. Served over thick strands of parpadelle, this is comfort food heaven. Season the beef with some salt and pepper then heat the oil in a large heavy based pan over medium-high heat. Once hot add the beef and cook for a couple of minutes on each side to seal all over. Place the beef into the slow cooker. Now add garlic, onions, celery, and carrots to the saucepan, again over medium-high heat. Sauté, stirring, until soft, around 5 minutes. Add the wine and continue to saute until the liquid has almost disappeared (1 minute or so). Add the tomato paste, tomato puree and beef stock and stir through. Bring it to a simmer. Now add the rest of the ingredients; oregano, sugar, pepper, salt, bay leaves and milk. Stir well to combine. Pour the mixture over the top of the beef in the slow cooker and cook on low for 6-8 hours, mixing it around every so often. It's ready when the beef starts falling apart with a fork and not much pressure. 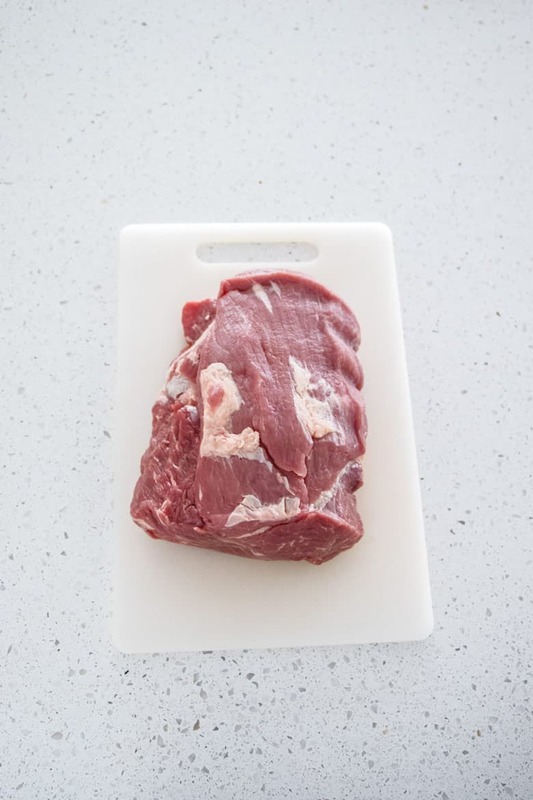 Place the chunks of meat on a chopping board and use 2 forks to pull it apart. Return it to the slow cooker and mix well. Bring a large pot of water to a boil. Season with salt; add pasta and cook, stirring occasionally, until just al dente. Drain quickly, reserving ½ cup of the pasta water. Add the pasta straight to the ragu, and toss to coat. Stir in some of the reserved pasta water by tablespoonfuls if sauce seems dry. Divide pasta among warm plates. Sprinkle with grated parmesan and fresh parsley. Make this ragu up to 2 days ahead. 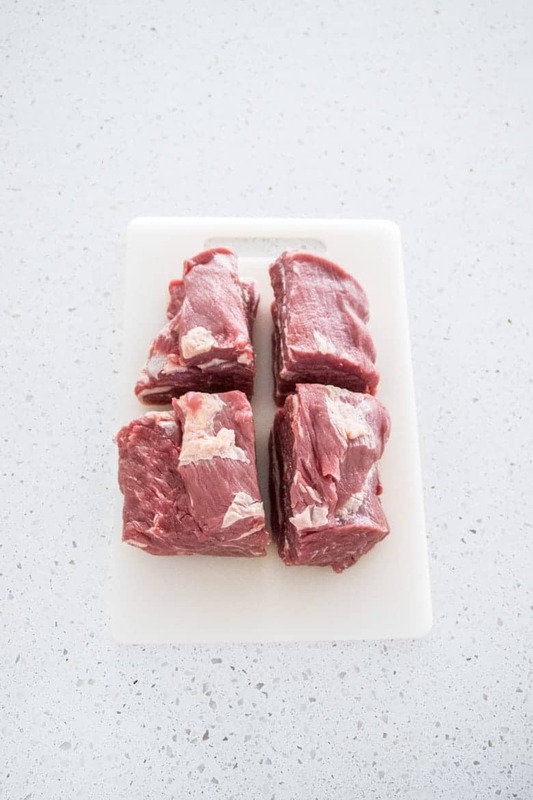 At the end of step 6, allow the ragu to cool for 30 minutes before transferring it to a covered dish and placing it in the fridge to cool completely. Reheat in a pot when required. 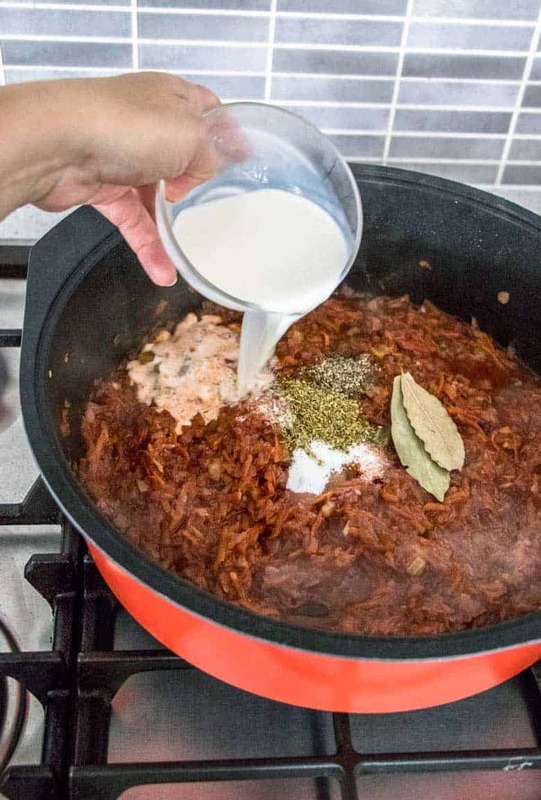 This ragu freezes well, for up to 3 months. Once cold, transfer it to a large ziplock plastic bag and freeze. You can even freeze it in smaller portions to have meals ready to go. Have you or any of your readers ever tried making this in the oven? This looks amazing but I don’t have a slow cooker and haven’t found a similar recipe made in the oven. Thanks! Hi Carrie! Thank you for your comment! 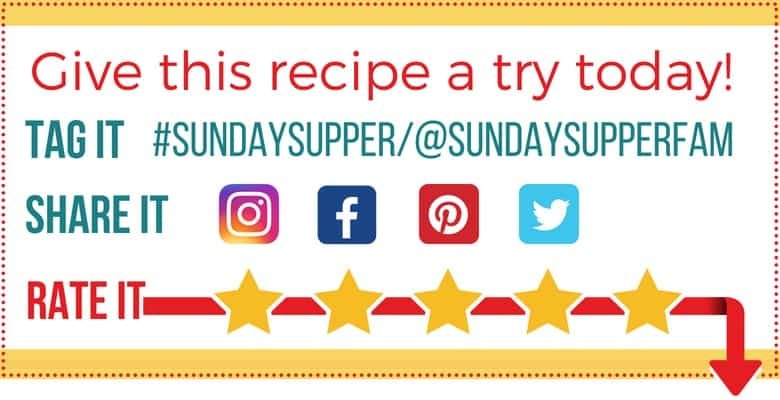 We’d love for you to try this recipe. Follow the remainder of the instructions as they are, and let us know how it goes! We’re looking forward to hearing from you about it!